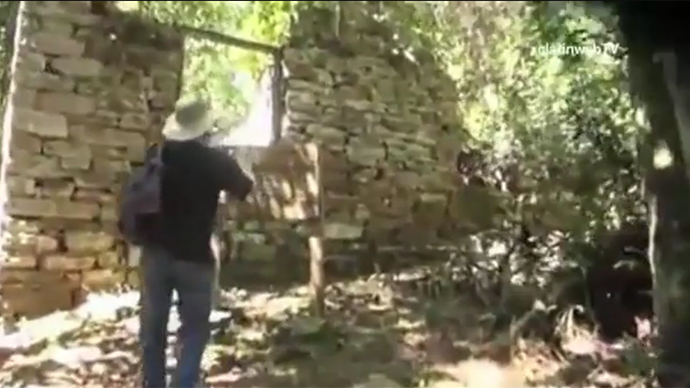 It might not be Hitler’s famous Wolfsschanze, but an Argentianian researcher has made a controversial claim that he has identified an apparent Nazi lair hidden in the Argentinian jungle. Researchers from the University of Buenos Aires (UBA), together with archaeologists from the Museum Andrés Guacurarí, stumbled upon ruins of a site that is believed to have been erected to house high-ranking former Nazi officials. The team is studying the buildings laying in relatively inaccessible part of the Teyú Cuaré Park, southeast of Misiones, on the border with Paraguay. The cluster consists of three stone structures, now covered by thick vines: Living quarters, a warehouse and a third structure that apparently served as a half-hidden lookout. The place is believed to be strategically sought by whomever built it, as it has a panoramic view and walls that are three feet thick. It also has an easy escape route to neighboring Paraguay, in the case that someone might have to quickly flee the country. The researchers found several objects they say indicate that the constructions were carried out in the first half of the 1940s. Among the most significant findings are German coins from between 1938 and 1944 and porcelain from about the same period. Although there was only circumstantial evidence to link the finding to Nazis, Schavelzon believes there could not be any other explanation as to why anyone else would have put so much effort and money into building in a place almost completely inaccessible at the time. The architecture and materials used were also atypical of this region. CAU scientists doubt that the Nazi hierarchy ever used these shelters. The evidence of a Nazi presence there suggests that it was only used at the stage of construction. “Apparently, halfway through the Second World War, the Nazis had a secret project of building shelters for top leaders in the event of defeat – inaccessible sites, in the middle of deserts, in the mountains, on a cliff or in the middle of the jungle like this,” Daniel Schavelzon, leader of the team who spent months exploring the site, told Argentine media. Local legend, however, has it that Martin Bormann, one of Hitler’s close allies and the head of the Nazi Party Chancellery, used to seek refuge in this jungle. A 1998 DNA test of a skull of a German killed escaping Berlin in 1945, showed that it belonged to Bormann, and that his supposed adventures abroad, rumored for decades, were just a myth. After WWII, thousands of German Nazis, as well as Croatian and Italian fascists, were allowed to escape justice in Europe when President Juan Domingo Perón welcomed them with open arms. An estimated 5,000 Nazis eventually found safe haven in Argentina. As the story went viral, and came under fire from skeptical archeologists, Schavelzon has scaled back his claims of finding an actual Nazi hideout.